Fisher-Folk of Carrick - A History of the Fishing Industry in South Ayrshire. The Royal House of Stewart. The Appin Murder: The Historical Basis of "Kidnapped" and "Catriona". 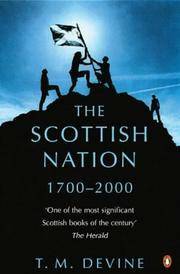 The Scottish Nation 1700 - 2000. Scotland's Capital - A Light-hearted history. The History of Scotland, translated from the Latin of George Buchanan, with notes, and a continuation to the Union in the Reign of Queen Anne. Glasgow. Blackie, Fullarton & Co. 1827. . Hardback. 4 Vols. Quarter leather with brown, patterned boards. All boards are loose but still attached. Very worn & rubbed copies. Spines are stripped or partially stripped. Contents are still well-bound. Suitable for rebinding according to taste. 8.6" x 5.5". 1. civ pp. + 447 pp. One loose page. Coloured Map of Scotland. Frontis. plate. 2. vi pp. + 630 pp. Frontis. plate. 3. vi pp. + 572 pp. Frontis. plate. 4. vi pp. + 644 pp. inc. index. Frontis. + one other plate. Wt: 3.5+ Kg. Extra postage outwith UK. Binding copy only. Myth and Reality: The Nature of Scottish Identity. Edinburgh. Saltire Society. 2013. . Soft cover. ISBN 9780854111091 Saltire Series No. 4. Cover design by Alasdair Gray. 7" x 5". 16 pp. Wt: 0.1 Kg. Fine. We Scots - a good humoured history. Traditions of the Covenanters: or, Gleanings among the Mountains. Mary Stuart's Scotland - The landscapes, life and legends of Mary Queen of Scots. Scottish Texts and Calendars - An Analytical Guide to Serial Publications. Edinburgh. Scottish History Society. 1987. . Hardback. ISBN 0906245087 1st Ed. EX-LIBRARY BOOK Crimson cloth with gilt spine titles with minor wear . Blind-stamp "Westminster City Libraries" to centre of front cover. Other library markings confined to lower spine & publisher's page. 9.5" x 6.3". xii pp. + 233 pp. inc. index. Wt: 0.7 Kg. Good.